Club players put a lot of time and effort into opening preparation. They learn many different systems, lines, and variations. However, they rarely encounter the lines learned from the book. Most often, because their opponents deviate early on and the familiar types of positions cannot be reached. How great would it be to learn a single opening system and apply it in most of your games with great results? Instead of learning 5-6 different openings and spending truckload of time preparing lines that’ll most likely never appear in your games… you could spend a fraction of time working on positions that you’ll actually play! Wouldn’t it make sense to learn the system leading to a similar type of position every time? Wouldn’t you want to only play the positions you know well, feel totally in control and comfortable with? It’s like having a home field advantage – every single time. In fact, it’s way more than that… since you’ll also have the ideas, plans, and maneuvers specific to just that type of positions… That is probably not the case for your opponent. The secret to Opening Mastery is not learning many different sorts of openings… like most club players think. It is learning few but in a greater depth, than your opponent! 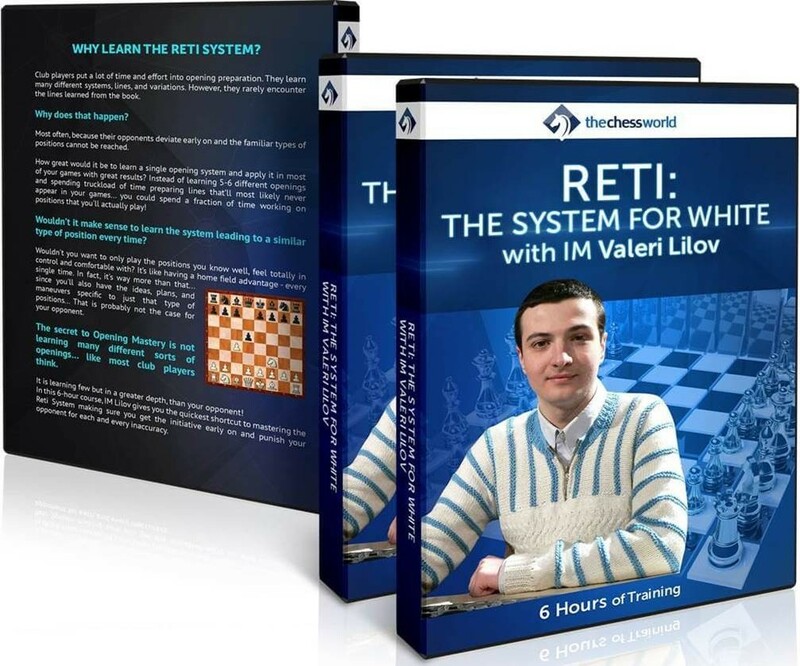 In this 6-hour course, IM Lilov gives you the quickest shortcut to mastering the Reti System making sure you get the initiative early on and punish your opponent for each and every inaccuracy. Reti is a great choice for club players because you learn setups, move sequences and opening complexes rather than individual lines and variations like you’d normally do! Your knowledge is based on the understanding of opening themes rather than move memorization. It is a very dynamic, flexible system giving white high chances in fighting for a serious advantage. It has been tested on all levels from armatures to elite Grandmasters and proven to be very solid and reliable. This course provides you with everything you need to master The Reti System, taking most of the anxiety and stress of your games. If you want to learn a clear path to opening advantage for white, this course is for you!